Kegs can be a great way to store your mead. No bottles and corks or caps to deal with, especially if you’re entertaining a large group. It simplifies things, is compact and easily portable, and provides an efficient delivery method all at the same time. A 5 gallon keg can hold roughly the equivalent of 25 wine bottles. Good luck carrying those to a party. This guide will help you avoid those issue after you learn how to keg mead. Beyond just holding and dispensing your brew, however, kegs can also be used to force carbonate. There’s generally two ways to carbonate your mead: allow it to happen naturally with a small amount of fermentation still occurring after you bottle it, or forcing the gas into the liquid from an external source. The first option comes with the risk of miscalculating how much fermentation can take place, and causing the bottle to explode. Or at least the cork to pop. But they’re both messy. Kegs, on the other hand, are built to withstand a much larger amount of pressure than glass bottles. They may seem a little daunting at first. I know I was intimidated by all the valves and tubes and connections, but they are actually quite simple to use. I recently acquired a Draft Brewer Cannonball 1.75 gallon mini keg. It’s perfect because I don’t have a ton of extra space in my apartment, so this was going to be my first foray into kegging. Small, compact, easy to store. It has proven to be quite simple to work with, and has performed an admirable job. First step, as usual, sterilize the keg’s interior. There’s no point in getting your mead this far only to introduce some bad bugs, now. This includes the interior of the keg, as well as all the hoses and fittings. Anywhere that the liquid could reach. Do not use bleach to clean a keg. Bleach can cause corrosion with stainless steel, even on brief contact. This, in turn could ruin the keg, or at the very least introduce even more surface for bad microorganisms to hide, making it even more difficult to clean in the future. Next, you will want to siphon your mead into the keg. It probably wouldn’t be the end of the world to pour it in slowly if you must, as we will be forcing CO2 into it; but the less splashing around it does, the better. Place the lid back on the container, and seal it. Mine has a lever that pulls everything nice and tight against the gasket. Here’s the slightly tricky part. I missed it initially on my first attempt and realized I had a small leak in my connections. Your Regulator has a small O-ring washer – mine was plastic – that fits in between the tank and the regulator thread. Mine came twist-tied to it and I didn’t see it at first. Without it, I was unable to create a good seal. The same can be said about the smaller plastic washers for each of the hose connections. Once the tank and regulator are connected, there’s a nozzle on the bottom of the regulator to attach a hose, which in turn connects to the IN port ( small upward facing connection point near the lid). This will be the pathway the gas will take to pressurize your tank, so make sure the connections are nice and tight or else you could end up emptying your tank before it hits your brew. Next hook you can hook up the out nozzle with the pouring hose if you plan to use it there, or you can save that for later. This process could several days to a couple weeks. Next, make sure the valve on the regulator is closed. Turn the main valve on the top of the air tank. Ensure there’s no leaks. Then, make sure the regulator adjustment knob is turned to the low end and release the regulator valve switch to allow air into the keg. Now you can adjust the regulator to your desired pressure. 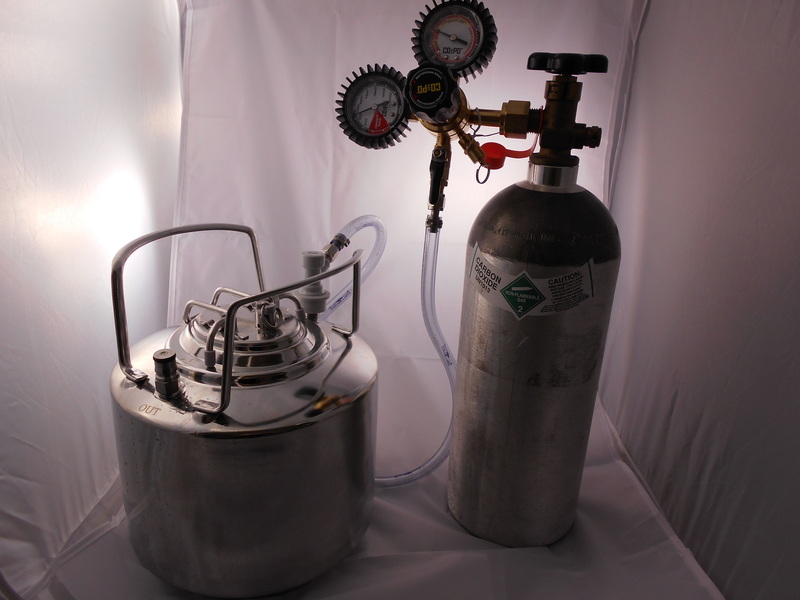 You’ll want to use the release valve on the top of the keg a few times to allow the CO2 to push excess oxygen out. Do this a few times. At this point, you can slosh around your keg a bit to increase the surface area of your brew to speed up the absorption of the CO2 into solution. Keeping your keg in a refrigerator will also increase this speed. After a few days to two weeks, your brew should be fully carbonated and ready to pour, or bottle. X – Axis: PSI. Y – Axis: Temperature. 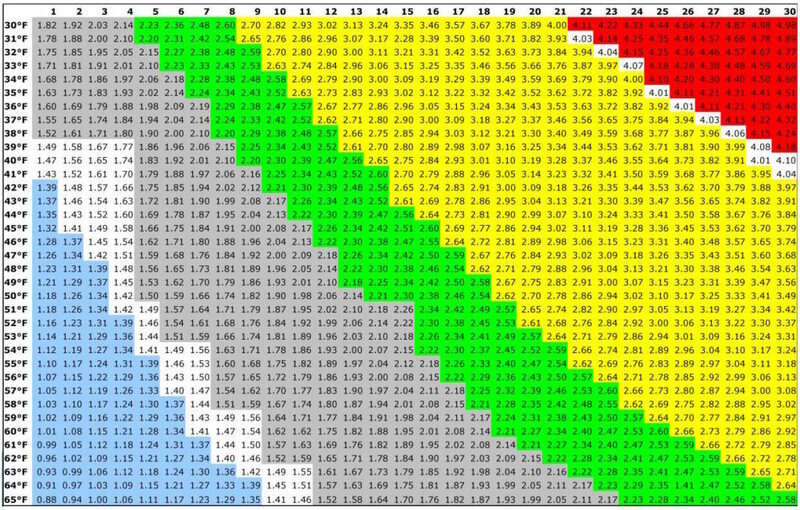 Each Cell denotes volumes of CO2 that will dissolve. Note: normal wine bottles are not made to withstand carbonation pressure, ESPECIALLY if you are carbing it in the bottle. Beer bottles, swing-top bottles, or special champagne bottles are purpose built for that.